Zhu Yan, represented by two 57-inch-square oils, paints in the style of China’s “new cartoon movement” that began in the 1980s as a spinoff from the internationally popular animated Japanese comics. His paintings of groups of identical, emotionless male performers on a stage appear devoid of ulterior content until viewers read their exquisitely sarcastic titles: “I Love Tianamen Square,” for example, shows a male chorus on stage, its curtains framing the Palace Museum (formerly known as “the forbidden city,” or imperial palace) supporting a portrait of Mao Zedong. Two fighter planes zoom above the building, leaving contrails behind them. An identical member of the chorus stands rigidly beside them, tightly clutching a bouquet to his chest, clearly without intending to surrender it. 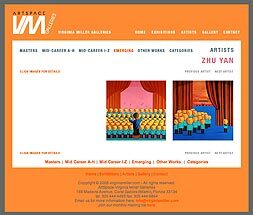 Three pages in the definitive “2007 Chinese Contemporary Art Document,” a juried catalog of leading artists, are devoted to Zhu Yan, with two full-page color illustrations of his paintings.